This adorable Polar Bear Family Ornament is an adorable keepsake to hang from your tree this year! Personalized with up to 6 names and any year, this Custom Christmas Ornament will create special memories you and your family can enjoy year after year. 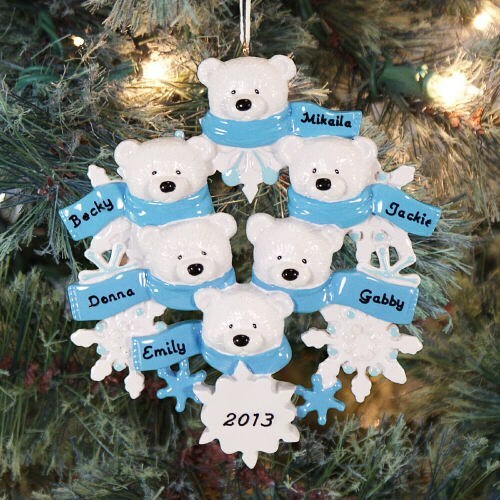 Our Personalize Polar Bear Family Christmas Ornament is made of resin. The adorable bear scarves can be personalized with any name and the snowflake with any year. The personalized ornament measures approx. 4" to 6" in diameter, depending on the number of teddy bears you choose. Choose between 2 to 6 teddy bears and begin personalizing this one of a kind keepsake. Additional Details Create one-of-a-kind holiday memories with Christmas Gifts from 800Bear.com. Whether you are shopping for Mom, Dad, Grandparents or siblings, you are sure to find the perfect gift from our Christmas Collection.